Men’s winner Alejo Muniz of Brazil. 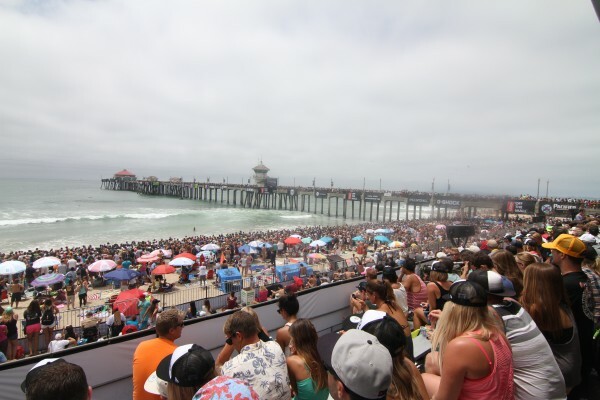 A wave of violence erupted in Surf City USA after the conclusion of the U.S. Open of Surfing on Sunday in Huntington Beach. Local police had to use tear gas and other non-lethal means to disperse an unruly crowd of hundreds that left a wake of damage to city vehicles, portable toilets, newspaper racks, store fronts and street signs. The melee marred what otherwise was a successful event that featured more than 40 women and 100 men competing in four divisions. Kolohe Andino, 19, of San Clemente missed out on a $100,000 payday, falling to 23-year-old Alejo Muniz of Brazil in a closely contested men’s pro final. A pair of 20-year-old Americans born two days apart battled it out for the $15,000 top prize in the women’s pro division, with local favorite Courtney Conlogue of Santa Ana losing to Carissa Moore of Honolulu by less than a point. Conner Coffin, 20, of Pasadena took home $4,500 after easily beating Carlos Munoz of Costa Rica to take the men’s junior pro title. Jake Halstead, 17, of Santa Cruz finished third. South Africa’s Bianca Buitendag, 19, got the best of 18-year-old Australian Nikki Van Dijk to win the women’s junior pro title, taking home $1,800 for her efforts. While 15-year-old Frankie Harrer of Malibu finished fourth. The weeklong event also featured skateboarding and BMX bicycle competitions. Several officers sustained minor injuries during the post-contest disturbance, which resulted in the arrest of seven people on charges ranging from disorderly conduct to resisting arrest. Women’s winner Carissa Moore from Honolulu, Hawaii.